The term radiation exposure refers to any occasion on which a human or other animal or a plant has been placed in the presence of radiation from a radioactive source. For example, scientists have learned that the radioactive element radon is present in the basements of some homes and office buildings. Radon gas gives off radiation that can cause damage to human cells. Anyone living in a home or working in an office where radon is present runs some risk of being exposed to the radiation from this element. The term radiation itself refers both to high speed subatomic particles, such as streams of alpha particles or beta particles, and to electromagnetic radiation. Electromagnetic radiation is a type of energy that travels in waves and includes such forms as X rays, gamma rays, ultraviolet radiation, infrared radiation, and visible light. Concerns about radiation exposure are, however, limited almost exclusively to effects caused by radiation emitted by radioactive materials: alpha and beta particles and gamma rays. Radiation comes from both natural and human sources. Many elements exist in one or more radioactive forms. The most common of these is an isotope known as potassium 40. Isotopes are forms of an element that differ from each other in the structure of their nuclei. Other radioactive isotopes found in nature include hydrogen 3, carbon 14, chlorine 39, lead 212, radium 226, and uranium 235 and 238. Humans and other organisms cannot escape exposure to radiation from these radioactive sources. They constitute a normal radiation, called background radiation, that is simply part of existing on Earth. Although some harmful effects can be produced by exposure to natural background radiation, those effects are relatively minor and, in most cases, not even measurable. Human activities have added to normal background radiation over the past half century. When nuclear weapons are exploded, for example, they release radioactive isotopes into the atmosphere. As these radioactive isotopes are spread around the world by prevailing winds, they come into contact with humans and other organisms. Background radiation: The natural level of radiation present on Earth at all times. Ionization: The process by which atoms or molecules lose electrons and become positively charged particles. Radiation detectors: Instruments that are able to sense and relay information about the presence of radiation. Radiation sickness: A term used to describe a variety of symptoms that develop when a person is exposed to radiation. Nuclear power plants are also a potential source of radiation. Such plants are normally constructed with very high levels of safety in mind, and there is little or no evidence that humans are at risk as the result of the normal operation of a nuclear power plant. On those rare occasions when damage occurs to a nuclear power plant, however, that situation can change dramatically. Accidents at the Three Mile Island Plant in Pennsylvania in 1979 and at the Chernobyl Plant outside Kiev in Ukraine in 1986, for example, caused the release of substantial amounts of radiation to the areas surrounding the plants. In both cases, people were either injured or killed as a result of the release of radiation. The harmful effects of exposure to radiation are due largely to its ionizing effects. Atoms and molecules contain electrons that can be removed from their orbits rather easily. For example, if a beta particle passes through an atom, it has the ability to repel any electrons in its path, ejecting them from the atom. The bonds that hold atoms together in molecules are made of electrons. A molecule of water, for example, consists of oxygen and hydrogen atoms held together by electrons. If radiation passes through or very near a molecule of water, it may cause electrons to be ejected from the molecule. When that happens, the water molecule may fall apart. The same process occurs in any kind of molecule, including proteins, lipids, nucleic acids, and carbohydrates, the molecules of which living organisms are constructed. Damage to molecules of this kind can have two general effects. First, when essential molecules are destroyed, an organism is no longer able to carry on all the normal functions it needs in order to stay alive and to function properly. A person, for example, may become sick if essential enzymes (substances that speed up chemical reactions) in his or her body are destroyed. Some of the symptoms of radiation sickness include actual burns to the skin, nausea, vomiting, and diarrhea. The specific effects observed depend on the kind of radiation to which the person was exposed and the length of exposure. For example, a person exposed to low doses of radiation may experience some of the least severe symptoms of radiation sickness and then get better. A person exposed to higher doses of radiation may become seriously ill and even die. All forms of radiation are invisible. You could stand in an area being flooded with life-threatening levels of alpha and beta particles and gamma rays, and you would never be able to tell. It is for this reason that anyone who works in an area where radioactivity is to be expected must be provided with radiation detectors. 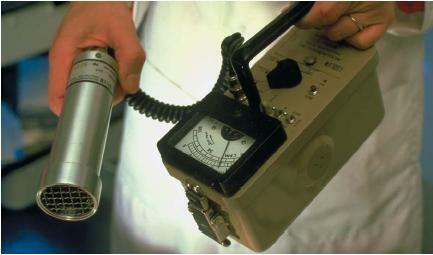 A radiation detector is an instrument that is able to sense and report on the presence of radiation. Many kinds of radiation detectors are now available. One of the most common of these is the film badge. A film badge consists of a piece of photographic film wrapped in black paper behind the badge. When radiation passes through the badge, it exposes the photographic film. The film is removed from the badge at regular intervals and developed. The amount of radiation received by the wearer of the badge can then easily be determined by the amount of fogging on the photographic film. A Geiger counter, another type of radiation detector, is a cylindrical glass tube with a thin wire down the middle. When radiation passes through the tube, it ionizes the gas inside the tube. The ions formed travel to the central wire where they initiate an electrical current through the wire. The wire is connected with an audible signal or a visual display. The clicking sound made or the light produced in the Geiger counter is an indication of the amount of radiation passing through the tube. Cloud chambers and bubble chambers provide a visual display of radiation. When radiation passes through a cloud chamber, it causes moisture in the chamber to condense in much the same way a contrail (cloud) forms when a jet airplane passes through the sky. In a bubble chamber, it is a string of bubbles rather than a string of water droplets that forms. In either case, the path of the radiation and even the form of the radiation can be traced by the water droplets or bubbles formed in one of these devices. The article is quit impressive and informative,but i couldn't find what i was looking for "the effect of background radiation on radioactive disintegration".But that not withstanding the article is a every nice one. What are the possibility of getting sick due to Network tower nearby? this is very informative good to find radon gas problem is taken in mind. When someone is buying a new house and orders an inspection, what percentage of your clients order a radon test?Apparently, basements are not the only danger if the house on a crawl put out 16.0. That story is disturbing. You mentioned it would have cost $1500 for remediation of the radon problem in your example. How much does a radon test cost? How often should a radon test be done? This article is extremely informative! Very interesting stuff! I plan on posting it to facebook so all I know can read it as well. Thank you! what is the classification of human exposure radiation? alright.! this is very informative.!! assignment accomplished.!! Its interesting and really informative subject but my ques was that did plants also harmed by radiation as much as humans beings?